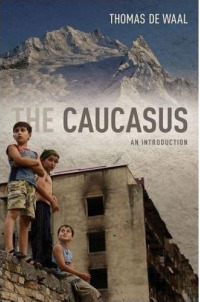 In this fascinating book, noted journalist Thomas de Waal--author of the highly acclaimed Black Garden--makes the case that while the Caucasus is often treated as a sub-plot in the history of Russia, or as a mere gateway to Asia, the five-day war in Georgia, which flared into a major international crisis in 2008, proves that this is still a combustible region, whose inner dynamics and history deserve a much more complex appreciation from the wider world. In The Caucasus, de Waal provides this richer, deeper, and much-needed appreciation, one that reveals that the South Caucasus--Armenia, Azerbaijan, and Georgia, and their many smaller regions, enclaves, and breakaway entities--is a fascinating and distinct world unto itself. Providing both historical background and an insightful analysis of the period after 1991, de Waal sheds light on how the region has been scarred by the tumultuous scramble for independence and the three major conflicts that broke out with the end of the Soviet Union--Nagorny Karabakh, Abkhazia, and South Ossetia. The book examines the region as a major energy producer and exporter; offers a compelling account of the Rose Revolution in Georgia, the rise of Mikheil Saakashvili, and the August 2008 war; and considers the failure of the South Caucasus, thus far, to become a single viable region. In addition, the book features a dozen or so "boxes" which provide brief snapshots of such fascinating side topics as the Kurds, Turkish-Armenian rapprochement, the promotion of the region as the "Soviet Florida," and the most famous of all Georgians, Stalin. The Caucasus delivers a vibrantly written and timely account of this turbulent region, one that will prove indispensable for all concerned with world politics. It is, as well, a stimulating read for armchair travelers and for anyone curious about far-flung corners of the world.